We’ve enjoyed the Brinkman Adventures for several years now. We were delighted to hear that they have a new season available, Season 6: Underground Rising. Unlike previous seasons, this one is much shorter, just 6 episodes, each about 25 to 30 minutes long. The stories were suspenseful and entertaining. Brinkman Adventures were originally about a large family, the Brinkmans, and their adventures as missionaries. However, in later seasons, they’ve expanded the stories that they tell to include a variety of people with important stories to tell and lessons to teach. We’ve had the pleasure of reviewing Season 2, Season 3, and Season 4, and we’ve loved each season. For this review, we received a digital download. We listened to it on our laptop, but you could easily listen to it on the go with a mobile device. While all of the stories were good, the Dutch Underground episodes particularly caught our attention. Little by little, I’ve been introducing Cuddle Bug (8) to the Holocaust and World War II. Dutch Underground is about the Brinkman kids’ grandma sharing about her time in the Dutch Resistance along with her husband when they were both young. This story was a gentle lesson about the Holocaust, and I had a few opportunities to explain to Cuddle Bug just how dangerous the times were. When the Nazi’s come to the grandmother’s home, her husband hides in an underground hole, which, luckily, the Nazis do not find during their search. Cuddle Bug said to me, “It’s lucky she’s there, and she’s pregnant; they won’t arrest her.” I paused the audio to tell her that the Nazis did arrest women and sometimes kill them. She was surprised, and when we turned the audio back on, within a minute or two, the grandmother was arrested. Cuddle Bug looked up from the craft she was working on, eyes wide, as her belief was proved wrong. The Brinkman Adventures’ website has a “Real Stories” section, and in one of their podcasts, you can listen to the real story behind the Dutch Underground audio story. There are real stories for every one of the episodes in this season. I liked listening to I Wonder Why. A family suffers a miscarriage, and the parents decide to work at an orphanage in Indian, in part because of their loss. However, their time in India is not smooth or idyllic. The kids at the orphanage are always fighting, and their young son, Huck, has multiple allergies and almost dies at one point. After 14 months in India, they feel discouraged and ask God for a sign if they should stay or not. This story resonated with me because too often, we feel God has called us to something, but when that path is difficult, we think maybe we misunderstood God or took the wrong path. Yet, even through the difficulty, we may be just where we need to be. All of these stories, like other Brinkman Adventures seasons, are deep in faith and inspirational. If you’re looking for a family friendly audio that is also exciting and suspenseful, you can’t go wrong with Brinkman Adventures. From now until October 31st, use the code FALL10 to get 10% off your Brinkman Adventures order! Keep up with Brinkman Adventures via Facebook. 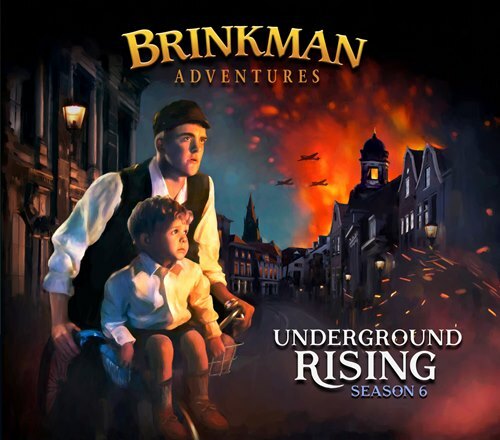 I was one of 70 people to review Brinkman Adventures Season 6: Underground Rising. To read more reviews, click on the link below.